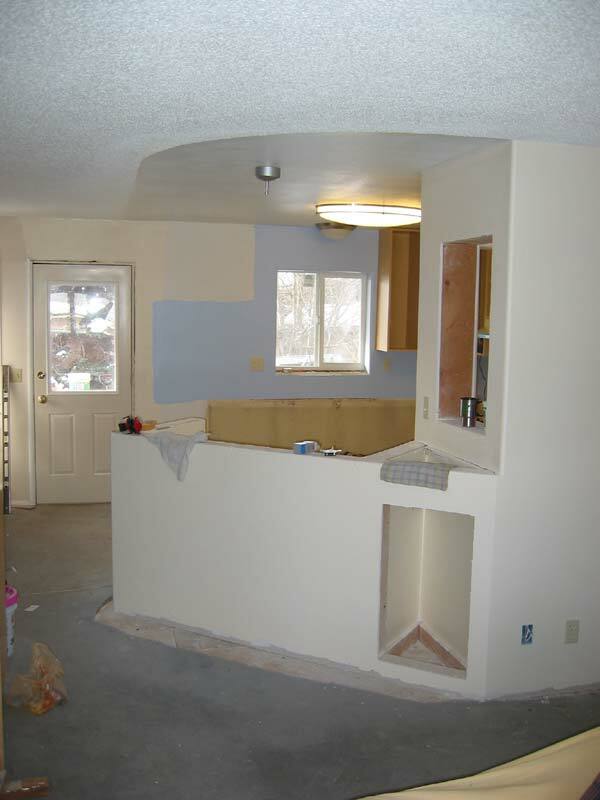 Over the winter I did a major kitchen remodel of a neighbor. 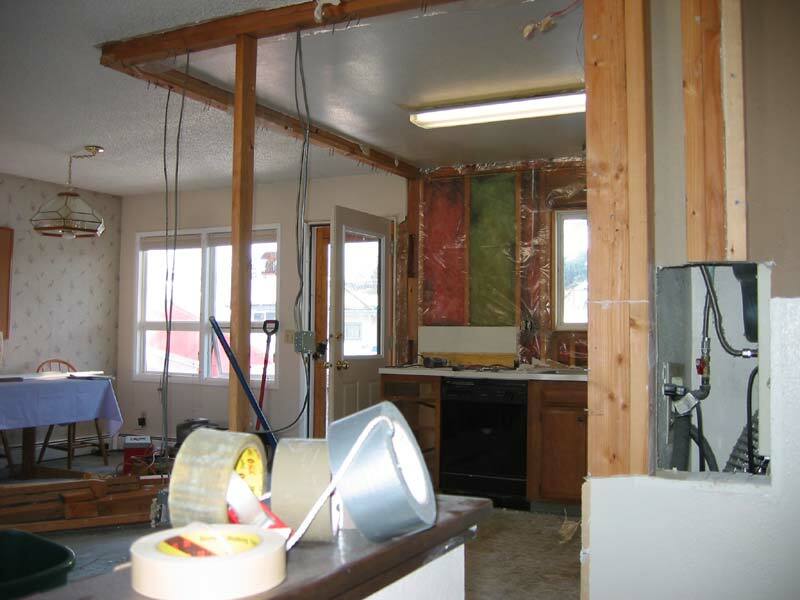 We gutted the old kitchen, removed two walls, replace the kitchen window, added a walk in pantry and a breakfast bar. Another shot of the tear out. 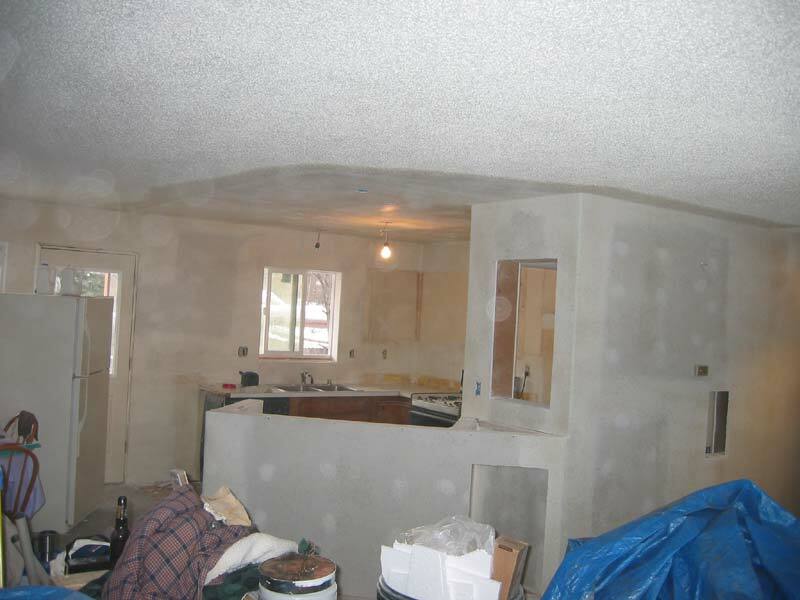 Note that we'll have a bit of drywall work on the ceiling and the electrical will need to be rerouted. wasted space under the counter. 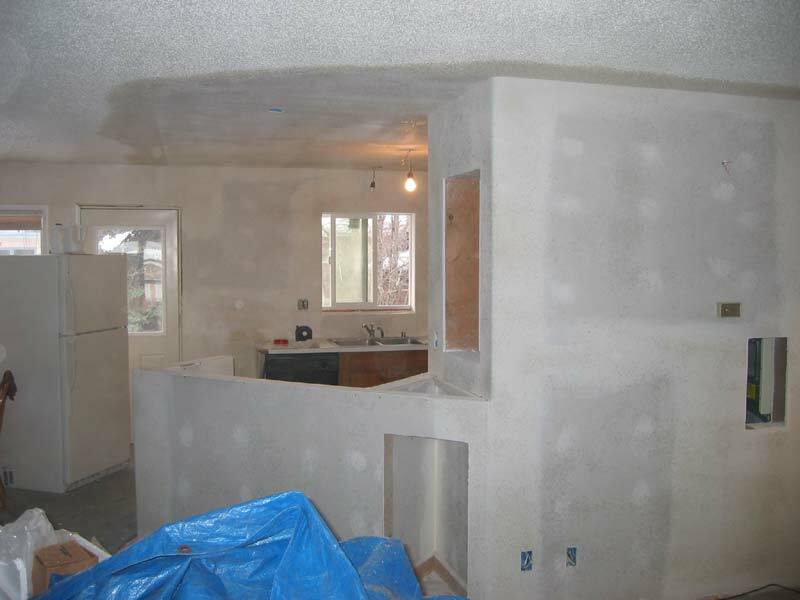 You can see the walk in pantry in this photo. The opening into the pantry will become a built in bookcase. 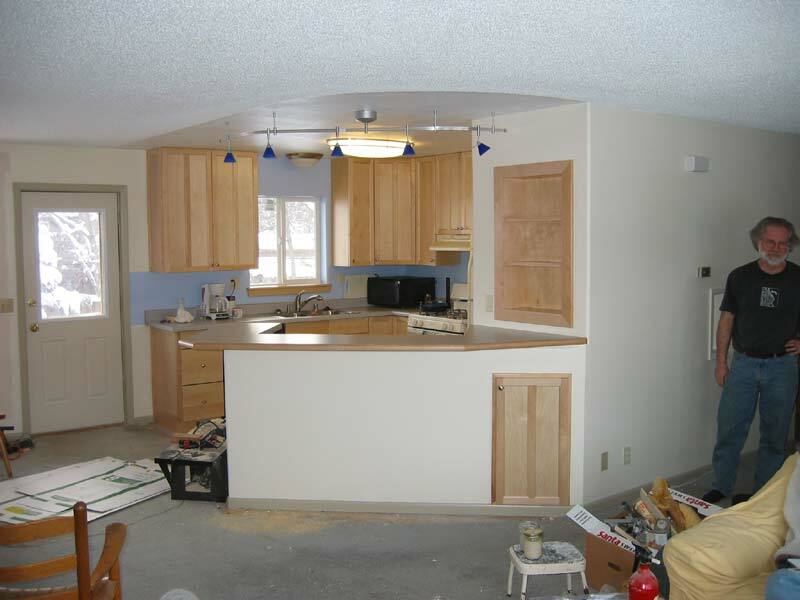 to install the kitchen cabinets. 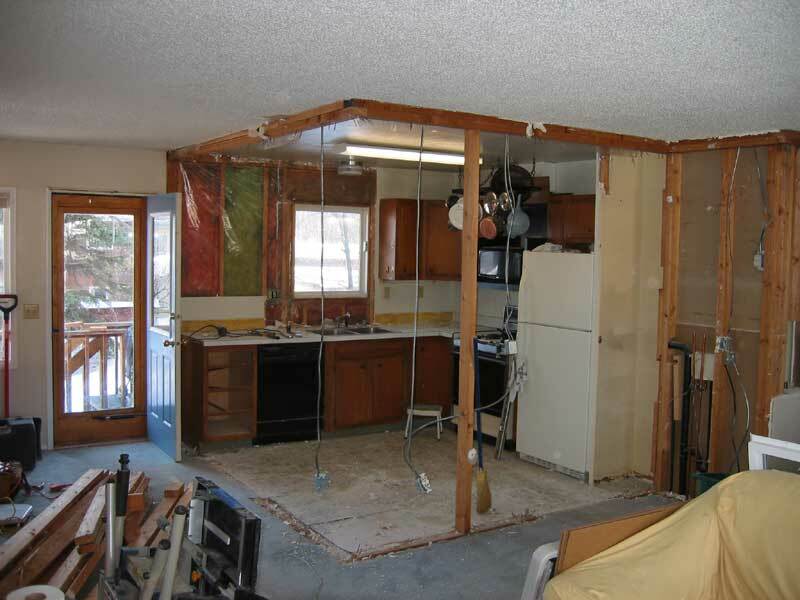 We've waited as long as possible before removing the last set of old cabinets and sink to make it easier for the owner lead a normal life during construction. in the kitchen. 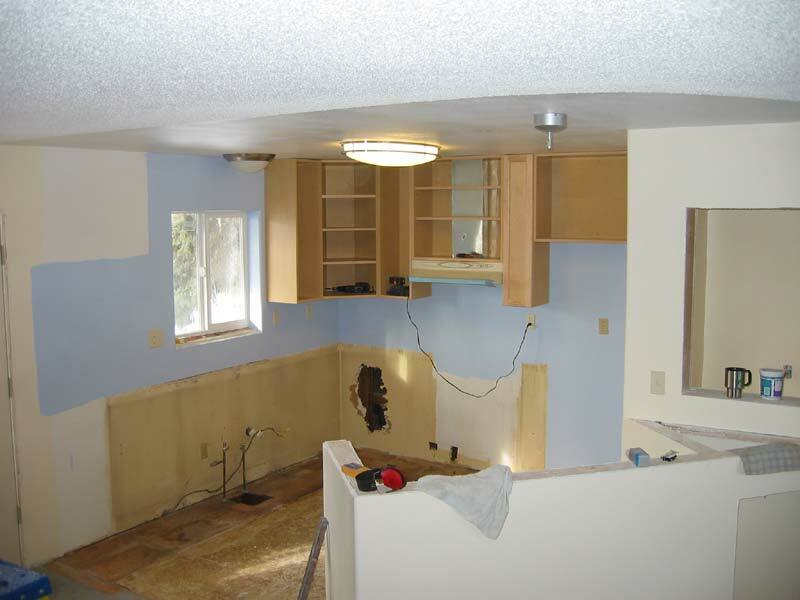 We were faced with a challenge to provide a transition without remove the acoustic texture in the living and dining room. 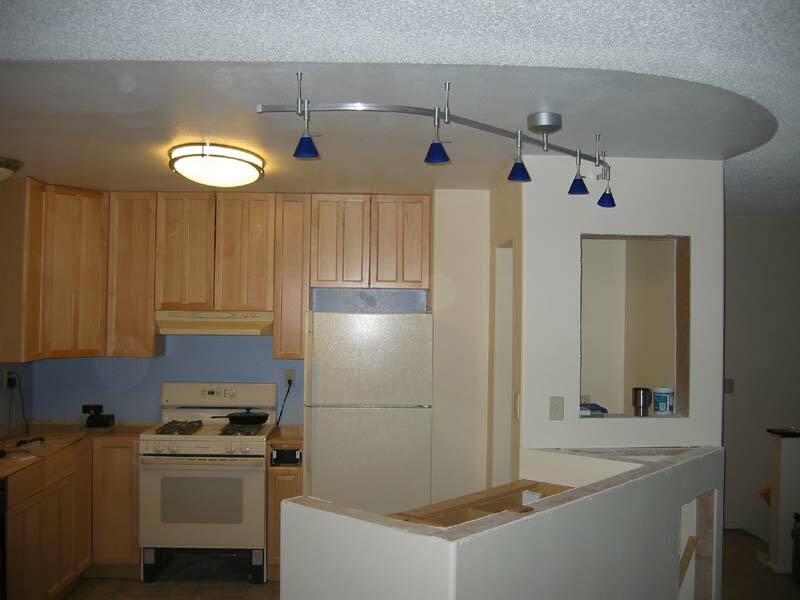 We've replaced the kitchen lights and added the transformer for the track lighting above the breakfast bar. 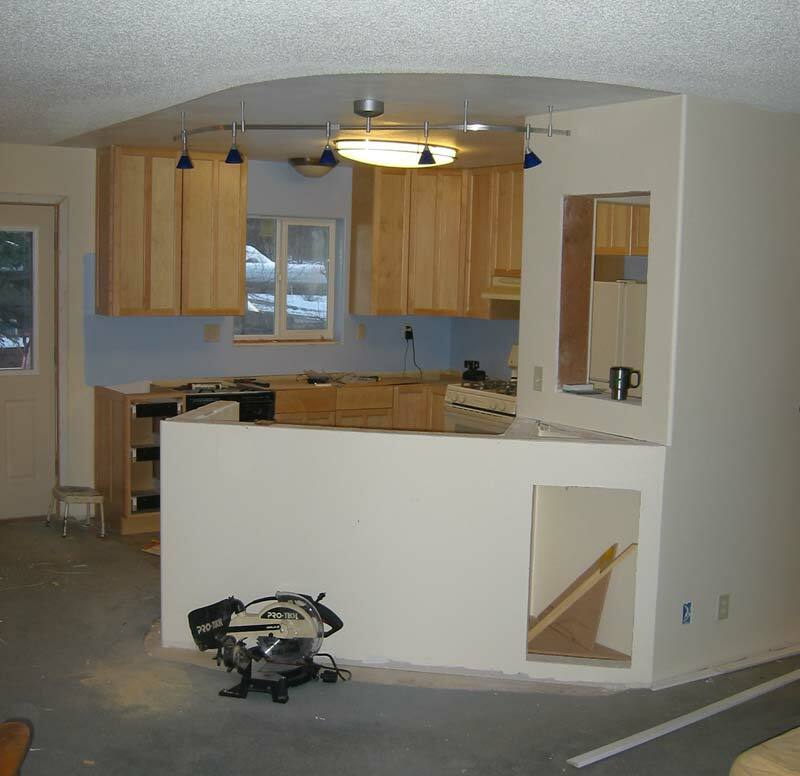 Installation has been completed of the kitchen cabinets. We've move out the door to the deck to allow for later installation of extra insulation and new siding. The track lighting is now in place. 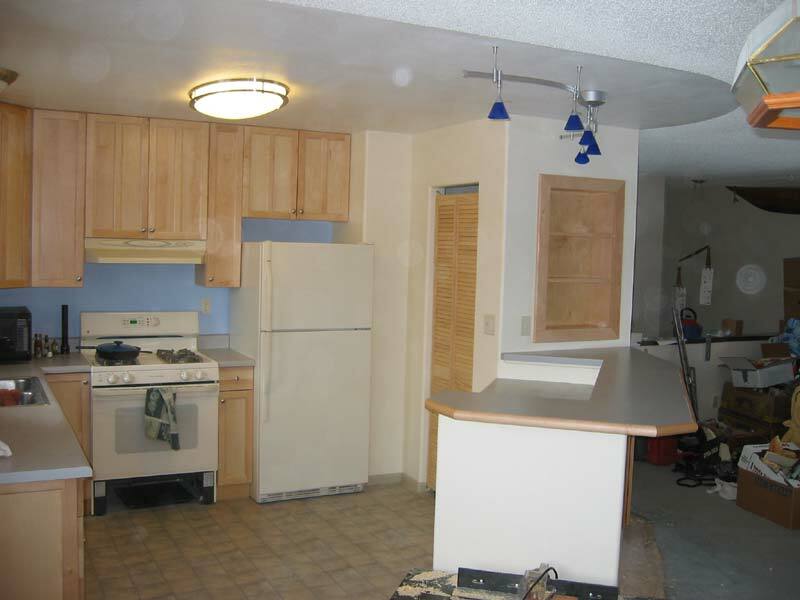 We've installed a new kitchen range, but reused the refrigerator and dishwasher. We've also added a garbage disposal. The kitchen is now complete. 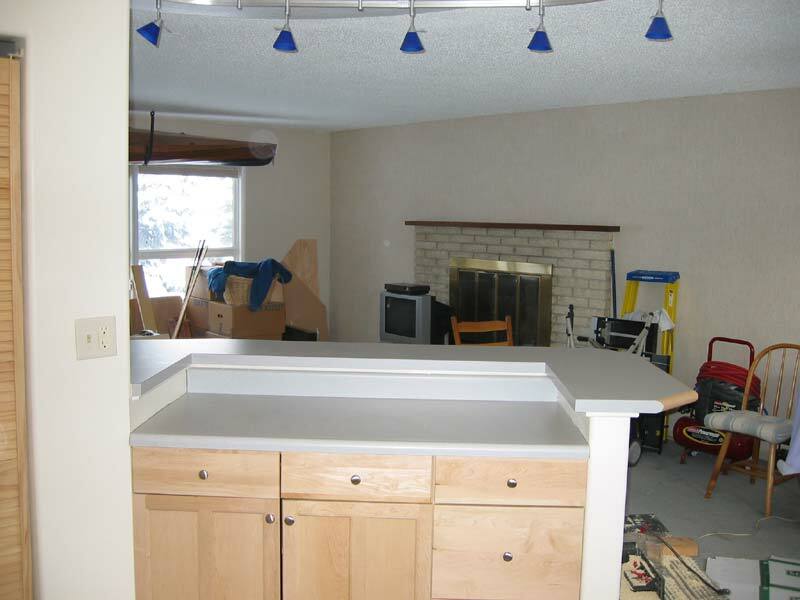 The new countertop is on and we've added trim and a door to the below counter storage space. The built in bookcase has been built and installed. We built cafe door for the pantry to provide easy access but still hide the shelving inside. 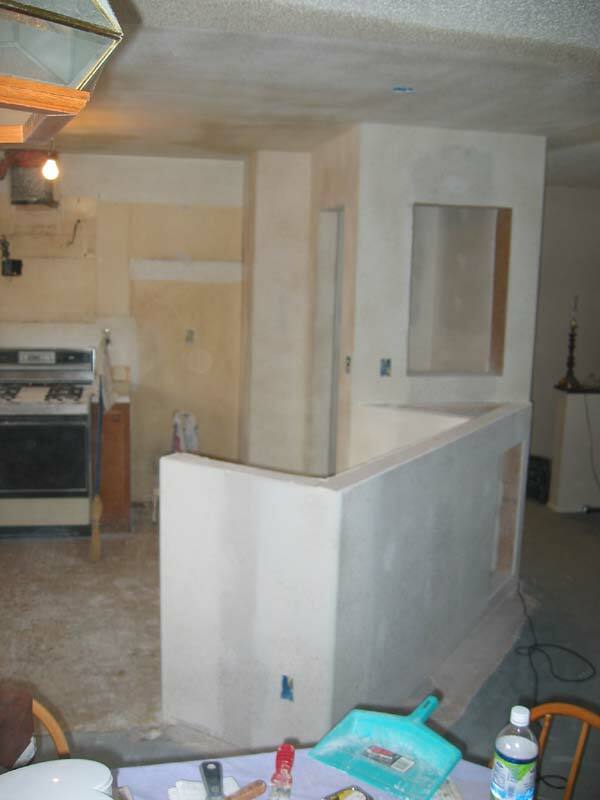 Here is a detail of the breakfast bar looking into the living and dining room. New carpet will be added at a later date.